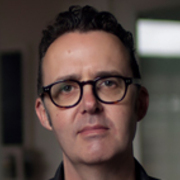 Jonathan Brough's career kicked off in style, when his second short film The Model won a slot at the 1994 Cannes Film Festival, as part of a special season of New Zealand shorts. The screenings marked a rare time the prestigious festival has devoted a programme to short films from a single country. Shot in hometown Hawera, The Model tracked the tension between an artist and his model. It was based on a short story by American Bernard Malamud. Brough's own father John, a veteran of local theatre and occasional television roles, played the artist. Co-star Susannah Devereux would soon reinvent herself as a horror actor in the US. The following year Brough made The Conversation, a series of four mini-shorts which later won screenings at London's Institute of Contemporary Art. Next came the ambitious Permanent Wave (1996). Filmed in one extended take, the short offers a portrait of the Kiwi OE experience, via the lens of a party in a London flat. By now Brough and playwright David Geary had joined together to work on their first documentary, The Smell of Money. It screened in April 1993, and examined tough times in Fielding after the recent closure of the local freezing works. In 2004 Brough directed four episodes of ensemble series The Insiders Guide to Happiness. He also directed a number of documentaries backgrounding the making of Whale Rider, which were included as extra features on the Whale Rider DVD. Extended doco Riding the Wave: The Whale Rider Story sold to America's Public Broadcasting Service. Brough is proud of helping establish political mockumentary series The Pretender in 2005. The show follows a "deluded, idiotic, quite possibly deranged" businessman as he becomes a politician, and eventually holds the balance of power. The NZ Herald's Michele Hewitson was among those keen on the show's satire, arguing that its main character (played by Bob Maclaren) "is so awful you couldn't make him up". Brough directed the opening episodes of both seasons. Brough has described his 2004 short No Ordinary Sun as "the closest yet as a statement of what I want to achieve as a filmmaker". Set in Antarctica and partly shot there, the sci fi tale centres on an isolated researcher dealing with loneliness and unsettling events. Nominated for best short at the 2005 NZ Screen Awards, it won the inaugural Friends of the Civic award for best NZ short at the Auckland Film Festival, and was selected for Edinburgh and Slamdance. Brough's directorial CV reveals a wide range: from Westie tale Outrageous Fortune to comedy shows The Millen Baird Show and Radiradirah, to documentary series Neighbourhood, Rob Tapert fantasy Legends of the Seeker, and 38 episodes of the long-running Power Rangers franchise. In 2008 he travelled to Russia to chronicle the charity work of Kiwi Rachael Hughes, for documentary Russia's Forgotten Children. He has also brought his directing and editing talents to two series which mined comedy from news and archive footage: Eating Media Lunch and its spin-off, The Unauthorised History of New Zealand. Brough began making his mark in Australia in 2011, with award-winning ghost series Spirited. Over the next few years he juggled projects on both sides of the Tasman. Back in New Zealand, he directed another short film, shaggy dog tale Snowmen — which was invited to the Interfilm Festival in Berlin — plus episodes of Downlowconcept comedy series Coverband. In Australia, he was series director for 2013's It's a Date, a comedy series which pulled its fictional daters from a cast numbering over 130. The show was described as "inventive, touching and surprising" by Melbourne newspaper The Age. Brough also helmed episodes of Logie-nominated ABC drama The Time of Our Lives, which co-star Claudia Karvan described as "Secret Life of Us for 40-year-olds". Since then Brough has amassed an impressive list of nominations for his work in Australian TV comedy. More than once he has ended up competing against himself in the same category. Brough proved his Australian stripes early by managing to survive a singing puppet and an alpaca, while helming series Sammy J and Randy in Rickett's Lane. The anarchic odd couple comedy starred comedian Sam McMillan (aka Sammy J). For his work on the first episode, Brough took the Australian Director's Guild Award for Best Direction in a TV Comedy. The following year he was nominated twice in the comedy directing category: for acclaimed, Tasmanian-set comedy Rosehaven (which the Sydney Morning Herald praised as "clever, insightful, surprising" and "really funny"), and for The Family Law, which centres on the teenage son of a self-destructing Chinese-Australian family. Brough is not to be confused with two other Kiwi screen figures: actor/comedian Jonathan Brugh (What We Do in the Shadows) and sometime Weta effects-man Jonathon Brough.